Although many schools and educational systems, from elementary to tertiary level, state that they endorse anti-homophobic policies, pedagogies and programs, there appears to be an absence of education about, and affirmation of, bisexuality and minimal specific attention paid to bi-phobia. Bisexuality appears to be falling into the gap between the binary of heterosexuality and homosexuality that informs anti-homophobic policies, programs, and practices in schools initiatives such as health education, sexuality education, and student welfare. These erasures and exclusions leave bisexual students, family members and educators feeling silenced and invisibilized within school communities. Also absent is attention to intersectionality, or how indigeneity, gender, class, ethnicity, rurality and age interweave with bisexuality. Indeed, as much research has shown, erasure, exclusion, and the absence of intersectionality have been considered major factors in bisexual young people, family members and educators in school communities experiencing worse mental, emotional, sexual and social health than their homosexual or heterosexual counterparts. This book is the first of its kind, providing an international collection of empirical research, theory and critical analysis of existing educational resources relating to bisexuality in education. 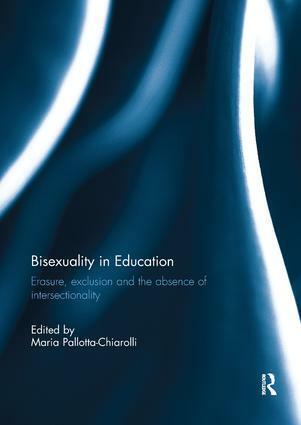 Each chapter addresses three significant issues in relation to bisexuality and schooling: erasure, exclusion, and the absence of intersectionality. From indigenous to rural schools, from tertiary campuses to elementary schools, from films to picture books as curriculum resources, from educational theory to the health and wellbeing of bisexual students, this book’s contributors share their experiences, expertise and ongoing questions. This book was originally published as a special issue of the Journal of Bisexuality. Maria Pallotta-Chiarolli is Senior Lecturer in the School of Health and Social Development, Deakin University, Melbourne, Australia, and author of eleven books. Her research is concerned with social diversity (genders, cultures, families and sexualities), and she is a founding committee member of the Australian GLBTIQ Multicultural Council.